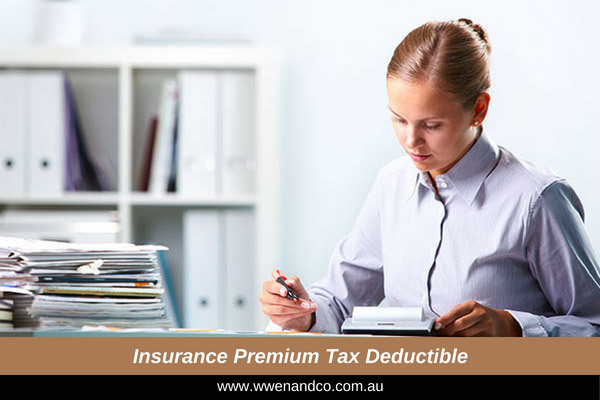 Is Your Insurance Premium Tax Deductible? As a general guideline, the ATO will allow a deduction for certain insurance premiums if you can show that the insurance cover relates to earning assessable income. In other words, life insurance, trauma insurance or critical care insurance are generally not claimable. Income protection insurance is one example of the kind of cover that may provide an allowable tax deduction for premiums – such claims have been allowed by the ATO in certain circumstances, even though having the insurance policy does not of itself “earn” income for the taxpayer. The deciding factor, especially if you are self-employed, seems to be the “ability” to earn assessable income. In such cases, this can mean that taking out disability insurance against loss of income could generate a tax deduction for the premiums. If you are running a small business, protecting your ability to earn an income can also result in insurance premiums that can possibly be deductible for cover for fire and theft, motor vehicles, public liability and loss of profit. It is always advisable for taxpayers to get specific advice for their situation, but deductions have been allowed for the above-mentioned insurance products, even though the cover may include some capital assets – that is, the value of the item covered (such as a vehicle that is essential to keep the business running) as well as the income-earning component of that asset. For the earlier-mentioned income protection cover, however, this is often offered with combined death or disability cover. This means there is also a form of “capital” that is covered – this being the value allowed for the death of a person, or that person’s injury or disablement, which if paid out is done so in a lump-sum. For the premium tax deductibility, it is strictly speaking only the income protection component that is allowable, which your insurance company should be able to break-down. The ATO has been known to disallow a claim on premiums if it cannot be shown the components for the “income” and “capital” sides of the cover. And when making a claim under such insurance, it is important to remember to declare the payout in that year’s tax return. For a business, cover for “key person” or “key employee” insurance can seem a straightforward case for deduction rights on the premium, but this may not always be the case. It can be a popular insurance cover, where the loss of a key employee, even if they are temporarily out of action, can be financially damaging to a business.